My family and I decided to get a German Shepherd pup , we got him at the beginning of April , He is now about 4 - 5 months old. He can be quite a nosy at times , he loves to socialise with other dogs and loves to be took walks , he also loves footballs. He loves being fed , as any dog would , but most of all he loves affection. Hes very loyal and protects the house. He can have his bad moments of mouthing but other than that hes a great dog. 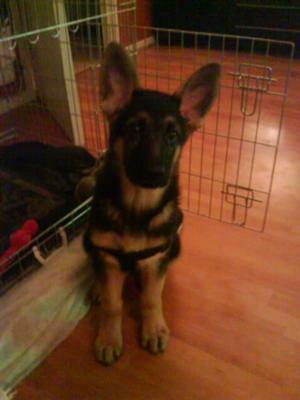 I hope my german shepherd Max will grow up to be a loyal and obediant German Shepherd.